Today, we ride the last stretch from Victorville to Santa Monica. Gary gives us our usual riders’ briefing before we set off. Not only do we have to watch out for potholes on California’s poor quality roads but we have to watch out for the traffic. We will be on the freeway for much of the journey and that means fast-moving traffic and lots of it. Not only that, LA drivers don’t leave much space between vehicles and they will often cut across several lanes in one move. We have to keep our wits about us. 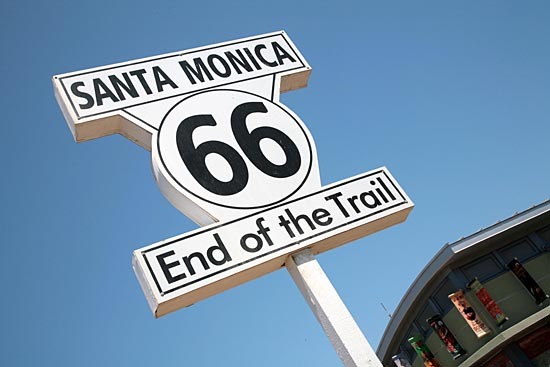 It takes just under two hours to reach Santa Monica pier. We had noticed that it was much cooler as we approached the coast – the sea breezes made a welcome change to the heat of the desert. It was a fantastic sight to see the sea. We had made it! We had travelled the 2600+ miles from Chicago to Los Angeles. We headed for the car park next to the pier and parked up. We walked up to the steps that take us to the roadway and pose for photographs next to the Will Rogers memorial plaque set in the grass above the beach. Then we head for the pier and lunch. Gary had booked us into Bubba Gump on the pier, one of a chain of seafood restaurants inspired by the 1994 film Forrest Gump. The decor was great and the seafood made a refreshing change. Françoise and I were both tempted by the prawns stuffed with crabmeat. I had a Lotsa Lava drink (coconut, pineapple and strawberry) – fantastic. So good, in fact, that I had two! Françoise went for a mango and lemon sparkler that arrived in a glass that sparkled with LED lights set into the base. She was able to keep the glass too. Afterwards, we had an hour or so to wander round. We strolled to the end of the pier taking snaps along the way. When we met up back in the car park, we moved to the side of the car park for one final group shot that Gary took with his camera. He promised to send us copies. Then onto the bikes once more to Bartel’s Harley-Davidson in Marina Del-Rey to hand back the bikes. Our trip was over. We spent a few minutes in the dealership before a mini-bus arrived to take us to our hotel for the night. There was one last event – the farewell dinner. We met in the hotel foyer and went to a private area of the hotel restaurant where Bearnard Behr was waiting. We enjoyed a good meal and Gary said a few words summarising our achievement and the friendships made within the small group we were. Gary also handed out some souvenirs (I won’t spoil the surprise for future Route 66ers). Dave was also presented with a Harley-Davidson T-shirt that said It Ain’t Over ’til the Fat Boy Sings. Dave was disappointed to not get a Fat Boy at the outset and this little surprise brought a smile to his face. Niell spoke on behalf of us all and gave a few words of thanks to Gary along with a card and a little something from us. Gary said that he had a full day the following day and wasn’t sure whether he would see us before we left for the airport. We said our goodbyes and made our way to our rooms knowing that we would be flying back with more than what we came out with. We planned to check in an extra case on the flight home (done in advance at the hotel which is the more cost-effective option). Luckily for us, Neill had purchased a Route 66 case along the road and therefore had an old case that was surplus to his requirements. We gladly found a use for it. We had filled two bags on the way out and now we would be returning with three. So, this is the end of the trail. We had made new friends, made lots of discoveries, seen and done many things and, above all, thoroughly enjoyed ourselves. The organisation was superb and many thanks go to H-C Travel in the UK, California Sunriders in the US and, especially, Gary who put an awful lot into this trip, as I am sure he does for every trip, to make it special. The memories will stay with us for a very long time as, I hope, this blog as a record and as a source of advice and guidance to others thinking of making such a trip. We certainly did get our kicks on Route 66.